On Wednesday, April 18, the Office of Student Engagement and Experiential Learning (OSEEL) will be hosting the ninth annual Undergraduate Research and Artistry Day (URAD), along with the fifth annual Community Engagement Showcase (CES), from 9 a.m. to 2 p.m. at the Holmes Student Center, Duke Ellington Ballroom. These two unique showcases offer students with the opportunity to display the outstanding work done through research programs, artistry projects and community-based engagements. These students participate in a variety of programs that OSEEL offers, such as Research Rookies and Huskie Service Scholars. 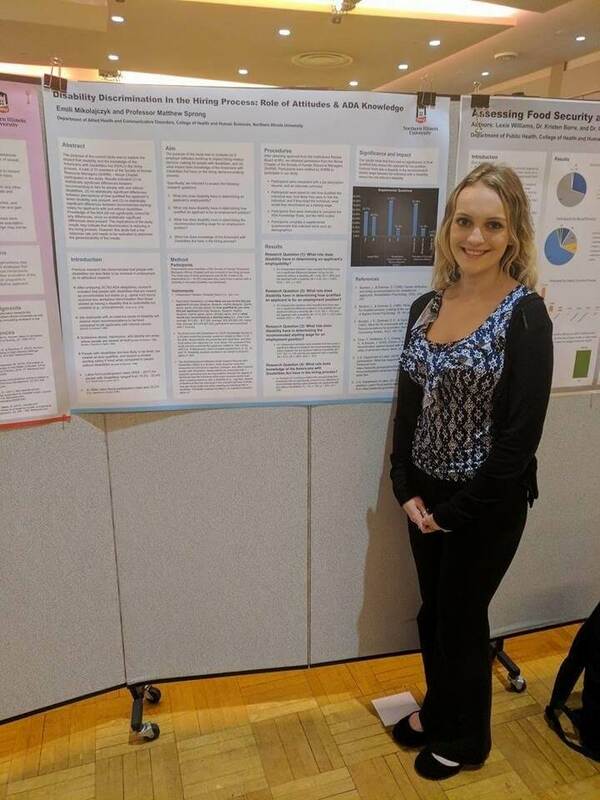 Emili Mikolajczyk, a sophomore majoring in rehabilitation services, is one of the talented and driven students participating in Research Rookies, who will be presenting at URAD for her second year. Mikolajczyk and her faculty mentor, Dr. Matthew Sprong, are two great representations of the College of Health and Human Sciences. Her research focuses on disability discrimination in the workplace, specifically the hiring process, and is examining knowledge of the Americans with Disabilities Act (ADA). Mikolajczyk is passionate about her research; in the future, she wants to help people and her research provides her the knowledge to better understand what people with disabilities are going through. This will be the second year that Mikolajczyk is showcasing her work at URAD. She prepared for it by attending poster-making workshops, which helped her to learn to format and what kind of content is important to include. Her mentor has also helped her prepare by teaching her how to properly conduct her research and to present the research she collected. Having presented at last year’s URAD, she feels far more confident in the basics and is now improving her skills as an effective presenter. This year, Mikolajczyk says she’s polishing up her elevator pitches so she doesn’t sound repetitive or staged, and can engage the audience more. Prepare to be impressed! To learn more aboutMikolajczyk’s project, stop by her poster at the URAD and CES Showcase.